As I write this, it’s New Year’s eve. Today, as 2013 inched nearer, a fun thing happened — I finally bought some new perfume (not an old favorite or a vintage scent, but a recent creation). My first, and last, new-perfume purchase of 2012 was House of Matriarch Destiny. The House of Matriarch is a Washington state-based natural perfumery whose scents are created by perfumer Christi Meshell; I came across the entire House of Matriarch collection at the Blackbird Apothecary in Seattle’s old Ballard neighborhood. I could have bought almost any scent in the line and been satisfied, but I decided on a perfume called Destiny. When I got home and researched House of Matriarch, I saw that Destiny is its best seller...and that impressed (and surprised) me, because Destiny is not a one-size-fits-all perfume. Imagine Bandit promenading down the street with his (yes, his) arm wrapped around Tubéreuse Criminelle; behind these two worthy perfume personages walks their offspring, a flower-child named Destiny. Of course Destiny is much younger than papa and does not exude as much power or purpose as Bandit: there’s pungent greenery, tuberose and jasmine in both, but these ingredients conjure a “tisane” in Destiny, a hefty elixir in Bandit. Both fragrances share a moss-infused genetic pool. As this family of perfumes walks farther from us, Madame T. Criminelle adds her own scent to Bandit's moss and flowers — a delightful trail of “clove” and mentholated tuberose (a floral-“wintergreen” aroma); Destiny mimics this cool vibe of maman, but is a bit sweeter in character — with a tinge of jasmine that lasts through the dry down. If you’ve admired Robert Piguet Bandit or Serge Lutens Tubéreuse Criminelle from afar, felt they were a little “too much” for you, do give Destiny a try. Destiny is a natural fragrance and its sillage and lasting power can’t compete with Bandit or Tubéreuse Criminelle, but I only have to reapply Destiny once during a day’s wear (if I allow my shirt or sweater to be dampened by the perfume I don’t need to reapply at all). I think I’ll save Destiny for spring and summer when a bright green chypre will have a chance to bloom on my skin. 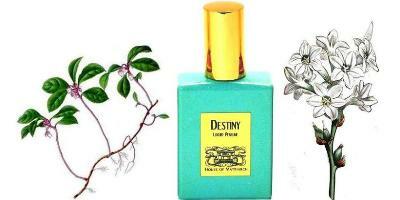 House of Matriarch offers Destiny Parfum in 15 ($120), 30 ($160) and 60 ml ($250) sizes; samples are available for $9. Destiny lists notes of Piper cubeba, tangerine, galbanum, tansy, gardenia, neroli, tuberose, Jasminum grandiflorum, Jasminum sambac, oak moss, benzoin, vetiver. Note: top left image [cropped] and top right image [altered] via Wikimedia Commons. LittleCooling: it smells like spring here in the NW…”cold” but vibrant. And spring is so FAR away! HA! A bit pricey, but it sounds like something I would like. Need to get a sample. SweetGrass: I need to get samples of the others in the line too…just sniffed them in the store. Nice to see a positive review for a “local” perfumer! I’m mostly unwilling to explore small distribution, niche perfumers out of some sort of perfumista survival instinct, but I will keep Blackbird Apothecary in the back of my mind next time I head up to Seattle. Thanks, Kevin! Marjorie Rose: you’re welcome…since you may be near Blackbird…do check out LUCCA too (about two blocks away)…they had a great selection of candles, soaps, Santa Maria Novella fragrances. Kevin, I had no idea Blackbird carries perfume! I thought they have men’s clothes only, so I never stopped there. Love the name of the company, and it is our Washington own. Perfume making companies are not so common in our beautiful state. BTW, Happy New Your to you and I would love to see more of your posts in 2013. Behemot: True…NW perfumers seem to be based more in Oregon/Portland than Seattle. Happy New Year to you too! Oh really? Do you have recommendations for Portland perfumers? Seems like when I’ve encountered things just by chance, it’s more hippie-scented-oils type stuff than more complex scents; but maybe I’m not ending up in the right places? Marjorie Rose: Of course I’m drawing a blank but I know OLO Fragrances, 40notes Perfume…there’s a biggie I’m forgetting! Pacifica is Portland based…. “Up the road” in Vancouver BC there’s Ayala Moriel…. Maybe a Portland native will write in with some more: ANGIE…WHERE ARE YOU? Slumberhouse and Imaginary Authors, for starters…. What a great way to ring in the new year, Kevin! They pretty much all smelled good, you say? They offer a sample set online…I haven’t ordered any samples yet in 2013 – I’d best get busy! Noz: REALLY! We ARE on day two of 2013…and NARY a sample yet? HAHAHA! Fortunately, I was saved by your getting to review something enticing this time – I’ll consider that a good omen for 2013! Thanks for the review, Kevin, it’s nice to read about some lesser known brands which I probably would never learn about otherwise. As it happens, both Bandit and TC would easily make it into my Top 5 Absolute Favourites list. You said that it’s worth trying if TC and Bandit are too much so my question is if you think it has anything new to add to those who already love and own the other two. How did I miss that this place sells fragrances????? Why did I not know this when I was in Ballard before Christmas. Nevermind, like I need another place to spend money in Ballard anyway. Oh, just looked at the rest of their wares online. There goes more hard earned dosh! How is the longevity on these, being mostly naturals? Additionally, am i the only one who is reminded of starbucks by their logo?